Many vintage textiles are too beautiful to use for their intended purpose. Others are damaged or just too delicate. That doesn't mean you have to put them in storage to keep them safe. 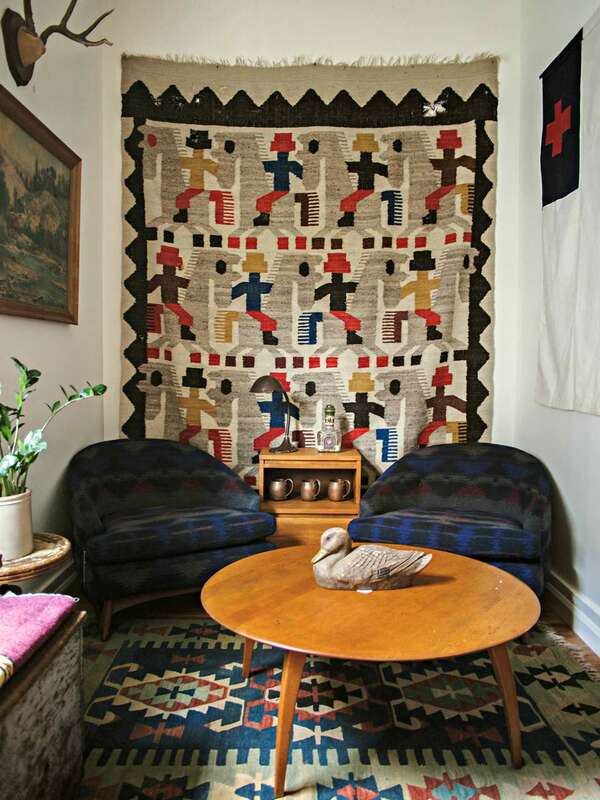 Instead, hang rugs, quilts, and other old textiles on your walls to enjoy them as artwork. Never nail textiles to a wall; you'll ruin them forever. Clip rings designed for curtains may seem like an easy solution, but they'll cause damage too. You must distribute the textile's weight evenly when hanging to avoid excessive stress on any particular spot. Measure your textile. Mark the hanging height (the spot where you want the top edge of the textile) on the wall with a pencil. Draw a pencil line on the wall representing the width of your textile. Use a level to keep the line straight. For rugs and heavy tapestries, draw the line 1/2 inch below the hanging height mark and 1 inch narrower than the textile width. For quilts, saris and other lightweight textiles, draw the line 1/4 inch below the hanging height mark and 1/4 inch narrower than the textile width. Cut a board to the length of your pencil line. Choose a board that’s 1/2- to 1-inch thick, depending on how far you want the textile to project from the wall. Use a 2-inch high board for rugs and heavy tapestries, and one that’s 1-inch high for quilts and lightweight textiles. Paint the board to match your wall color. Let the paint dry. Find the wall studs along your pencil line. Align the top of the board with the pencil line, and screw the board to the wall at the studs. Check the board with a level. Cut sew-on hook-and-loop tape to the length of your pencil line. Use 2-inch tape for rugs and tapestries and 1-inch tape for quilts and lightweight textiles. Staple the stiff half of the hook-and-loop tape to your board. Cut twill rug binding or drapery buckram the length of your pencil line. Cut it 2 1/2 inches high for rugs and tapestries, or 1/1/4 inches high for quilts and lightweight textiles. Center the soft half of the hook-and-loop tape along the length of the rug binding or buckram. Pin the hook-and-loop tape in place, and machine stitches it to the rug binding or buckram along both long sides. Lay your textile right side down. Lay your rug binding or buckram strip along the top of the textile, hook-and-loop side up. Place it 1/4 inch from the top edge for rugs and tapestries or 1/8 inch below for quilts and lightweight textiles. Make sure the strip is straight, even if it doesn’t follow the top edge of the textile exactly. Hand sew the top edge of the rug binding or buckram strip to the textile. Start from the center, and stitch out to both sides. Repeat with the bottom edge. Choose a needle appropriate to the textile’s weight and weaving, and use cotton thread. Use a backstitch on everything but quilts. Use a whipstitch for quilts, but don’t pierce the front layer of fabric. Attach the hook-and-loop tape on the textile to the tape strip on the wall.